“Yes, goat yoga is actually a thing,” the Des Moines Register wrote in October 2017, about four months after Iowa Goat Yoga started hosting classes at Coco’s Ranch in Palo, Iowa. The Register is one of a half-dozen media outlets who have commented on Iowa’s newest, eyebrow-raising yoga trend, but Google “goat yoga” and you’re likely to find hundreds of articles from across the country with a similarly incredulous tone. And you can’t really blame them. Videos of cats, dogs and bunnies invading yoga studios have become viral sensations, but the image of miniature goats jumping and bleating while yogis perform Sun Salutations is silly enough to attract an extra layer of curiosity and, perhaps, skepticism. Goat yoga — whose practitioners are called “gogis” — was popularized on the West Coast, and the endearing concept spread like wildfire. 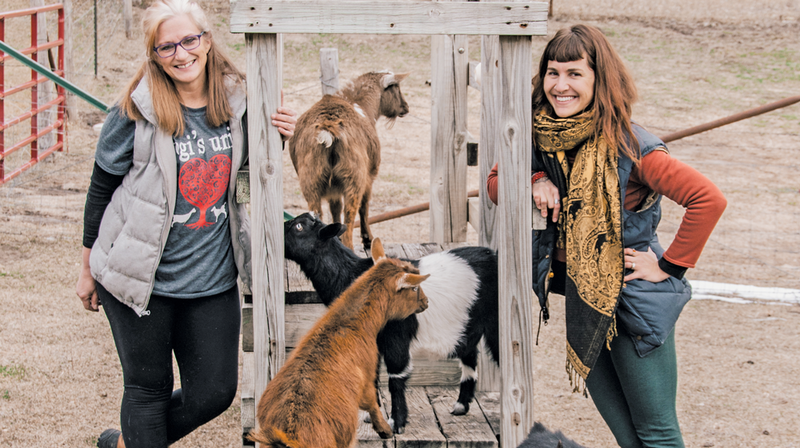 It may be safe to assume that L.A. yogis won’t be flocking to goat yoga in 10 years, but Iowa Goat Yoga founders Kimberly Jaeger-Arjes and Nancy Blanchard believe the practice will have staying power, at least in the Midwest. Goat yoga is certainly a change from the norm, assuming your norm is a studio yoga practice free of wildlife. At Iowa Goat Yoga, visitors pay $20 for an easy-going outdoor yoga class lead by Jaeger-Arjes (an instructor at Heartland Yoga in Iowa City), set in a fenced area with a calming view of cows, sheep and Iowa farmland. A small herd of Nigerian Dwarf goats — about one-third the size of a typical goat — join the dozen-or-so humans; the goats may pay a yogi little mind, or, more likely, they will plop down on her mat, jump on her back or even leave “blessings” — Blanchard and Jaeger-Arjes’ gentle name for droppings — in her vicinity. An open mind is encouraged, the women said, but not required. Jaeger-Arjes remembered a patron who was brought by his wife, and was so reluctant to participate he almost didn’t leave the car. It’s this quality that first drew Blanchard to goats. After seeing Nigerian Dwarf goats in an episode of HGTV’s Tiny House, Big Living, she became obsessed. Coco’s Ranch, owned and operated by Blanchard and her boyfriend Randy, already had cows, sheep and gardens. When Blanchard adopted her first goats, she didn’t have yoga in mind; they were just pint-sized dairy animals. 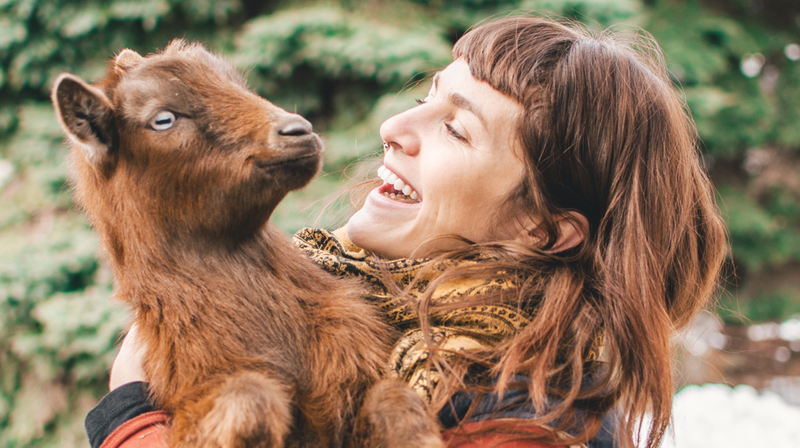 It wasn’t until she and Jaeger-Arjes, who used to work in the corporate world together, started to discuss the goat yoga trend that Iowa Goat Yoga was born. Bolstered by media coverage, the classes attracted more than 500 students in its first year. “I think it’s one thing to go to an awesome yoga class, which Kim does, then you add to it and it’s outside. And you add to it and there’s goats?! It’s one thing on top of another. It’s that perfect ice cream sundae,” Blanchard said. Jaeger-Arjes said goat yoga provides a much-needed opportunity for people to unplug and channel their attention into yoga; the sights, sounds and smells of farmland; and, of course, the activity of the goats. More than cats and dogs, Jaeger-Arjes said the goats embody ahimsa, the Sanskrit concept of nonviolence, an element of the first limb of yoga and the first Yama. The goats are not just tools or window dressing; they are the teachers, Jaeger-Arjes said. Blanchard said the goats seem to get something out of the classes as well. She cited Bess, one of the goats born at the farm. Blanchard and Jaeger-Arjes are always eager to introduce the goats to new students, and vice versa. During the 2018 goat yoga season, which began in late March and will likely continue through the fall, the Iowa Goat Yoga team plans to offer new elements, such as a loyalty program, yoga for first responders and a second teacher. No matter your age or yoga experience, Blanchard and Jaeger-Arjes encourage you to give the gogi lifestyle a try. It may very well be a permanent part of Iowa’s yoga landscape. Coco’s Ranch has 22 Nigerian Dwarf goats — and counting. More are born every season. Iowa Goat Yoga’s goats are named after U.S. presidents and first ladies, including Thomas Jefferson, Martha Washington, Bess Truman and Lady Bird Johnson. Like dogs and other animals, goats can be trained as therapy animals. They are sometimes assigned as companions to race horses to help lower the horses’ anxiety. Iowa Goat Yoga classes typically include 10-14 people (aged 18+) and 10 goats — one of the highest goat-to-human ratios in the “goga” business. After each class, students can wash their hands with a salt scrub, “so you don’t leave smelling like pure goat,” Nancy Blanchard said. 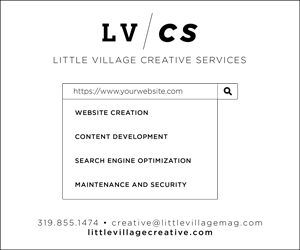 Students must pre-register and pre-pay (each class costs $20, including mat rental). 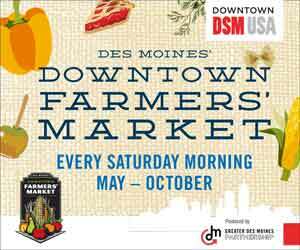 Check openings on the Iowa Goat Yoga Facebook page, and DM or email iowagoatyoga@gmail.com to sign up. 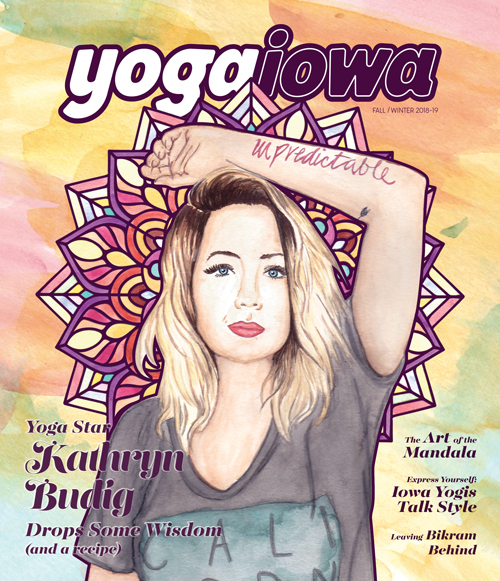 Emma McClatchey is YogaIowa’s managing editor. She’s used to her cat Ludwig getting all up in her business during home yoga practice, but yoga among goats felt like Christmas morning.